On this date just over a half-century ago, the up and coming Philadelphia Phillies made one of the better trades in their long history. On December 4th, 1963 the Phils sent outfielder Don Demeter and pitcher Jack Hamilton to the Detroit Tigers in exchange for starting pitcher Jim Bunning and catcher Gus Triandos. Bunning was already a 9-year veteran at that point. With the Tigers from 1955-63 he pitched more than 1,800 innings while fashioning a 118-87 record with a 3.45 ERA. He made 5 American League All-Star teams, and threw a no-hitter during the 1958 season. Ultimately Bunning would have two stints with the Phillies. In that first post-trade stint over four years from 1964-67 the righty went 74-46 with a 2.48 ERA, striking out 992 batters in 1,191.2 innings. Bunning was an NL All-Star twice during those years, nearly helped lead the 1964 star-crossed club to the NL Pennant, and pitched a Perfect Game on Father’s Day that year. He came in 2nd in the 1967 NL Cy Young Award voting. He would finish up his career with two final Phillies seasons in 1970-71, including pitching the Opening Game in the history of Veteran’s Stadium, a 4-1 win over the Montreal Expos. Of the other players involved in that original trade, Triandos served as the Phils backup catcher for two seasons. In Detroit, Hamilton made just 9 appearances over two seasons. He would go 21-27 over 6 seasons for 5 different teams. Demeter hit just .262 with 58 homers for 3 teams in 4 years after the deal. 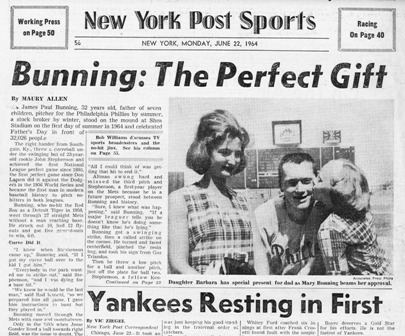 No matter how you slice it, the trade for Jim Bunning 51 years ago today goes down easily as one of the best in Phillies history. Bunning would be honored with a place in the Baseball Hall of Fame, have his uniform number 16 retired with the Phils, and is a member of the club’s own Wall of Fame.